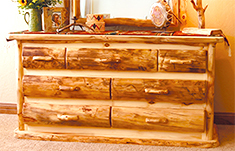 Log Furniture Company draws on a decades-long tradition of quality artisan-made furniture. We bring our customers the comfort and relaxed atmosphere of beautiful, rustic furniture. Our pieces are not only unique, they are made proudly and sustainably in the USA. Our exceptional brand of customer relations has helped us to be what we are today and will also help us to become a leading online retailer of the future. Our products are built from selectively chosen groves of dead standing timber in remote western mountain areas. 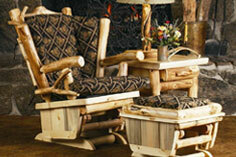 This ecologically aware practice results in rustic furniture that is beautiful, durable and environmentally ‘green’. The Log Furniture Company’s goal is to become a leading retailer of Rustic Log and Reclaimed Furniture and so we will work hard for the honor of being your first choice. Our range of exceptional products will satisfy all special home furnishing needs, from distinctive home accessories to the award-winning designs of our Log and Reclaimed furniture. And our dedication to consumer relations and service will provide you with the best in customer satisfaction. Enjoy the unique Log Furniture Company experience, and thank you for shopping with LogFurnitureCo.com!